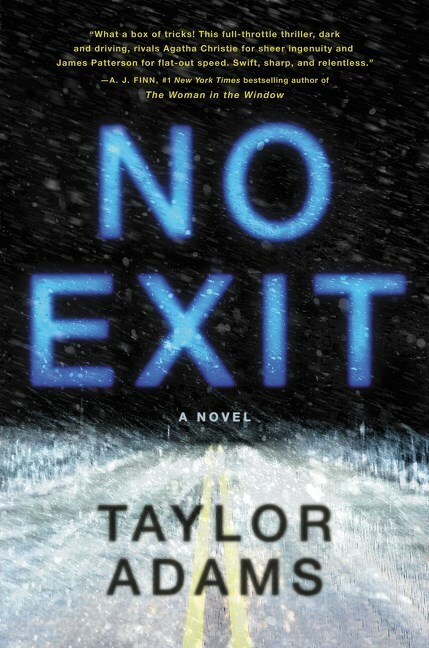 "The bitter chill of snow and a trapped child"
I found this thriller an absolutely gripping read, more so because I'm reading during winter and this book is set on a snow-covered mountainous road. The storm means that when student Derby Thorne pulls her small car off the road, she has NO EXIT. She is stranded at the Colorado rest stop with a handful of strangers, some bad coffee and no phone signal. Now, who is going to leave for a long journey with no phone charger? Not even one in the car that works off the cigarette lighter? Well, we just have to take it that Derby is having a very bad day -- she's trying to drive to see her seriously ill mother -- and she didn't realise how bad the weather would get, either. Stuck waiting for snow ploughs, being polite to unprepossessing strangers and bemoaning the lack of signal or charge, she discovers a horrible truth. One of the strangers has locked a child in the back of his van. Where I live, we'd immediately run to the group and demand help freeing the little girl. But in America, the panicking Derby knows that not only the bad guy but some of the good guys could be armed and she doesn't want to start a mad shootout. At about this point I had to put the book down, and I kept thinking about the story until I got back to it later. When I had to take another break, I couldn't wait to read again, and the next time I just had to finish the tale. Dinner getting cold and all. The bitter, energy-sapping snow and claustrophobia, the inevitability of violence, sinister kidnapper and tensions, make this a cinematic thriller that works very well. Author Taylor Adams has been a screen director so he doesn't waste time or energy on sub-plots. Yes, the twists are formulaic, but they serve to pile problem after problem on Darcy's head as she strives to free young Jay while keeping herself and others alive. The end of NO EXIT satisfied this reader, but I warn that there are really only two things you can be sure of. One is that the little girl will survive, because she kind of has to, doesn't she. The other is... no, actually, there's only one. Expect strong language, violence and stress in this adult thriller. A kidnapped little girl locked in a stranger�s van. No help for miles. What would you do? On her way to Utah to see her dying mother, college student Darby Thorne gets caught in a fierce blizzard in the mountains of Colorado. With the roads impassable, she�s forced to wait out the storm at a remote highway rest stop. Inside are some vending machines, a coffee maker, and four complete strangers. Trapped in an increasingly dangerous situation, with a child�s life and her own on the line, Darby must find a way to break the girl out of the van and escape.